Great piece of land for a resort, or a dream home, located just off Mabprachan Lake. 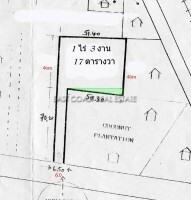 2 ½ rai (1000sqm), walled at a cost of 2,000,000 Baht, with a pool and guesthouse with 3 bedrooms and bathrooms already in place. Electric and a water well, provided. The land can be spilt in two if desired, please contact us for further details. The title deed is held in company name.